Creative play is such fun especially when I am using some leftover supplies. For these tags, I pulled out stamps, stencils, dye inks, alcohol ink scraps and the play began. As I finished them, I could imagine my husband asking one of his usual questions…..where will you put them?……what are they for? If you are like me, creative play does not need a final goal. The word "play" in this setting means "journey" and the end result often defines itself. When I was finished, I thought they would be an interesting card cover - cropped to fit. 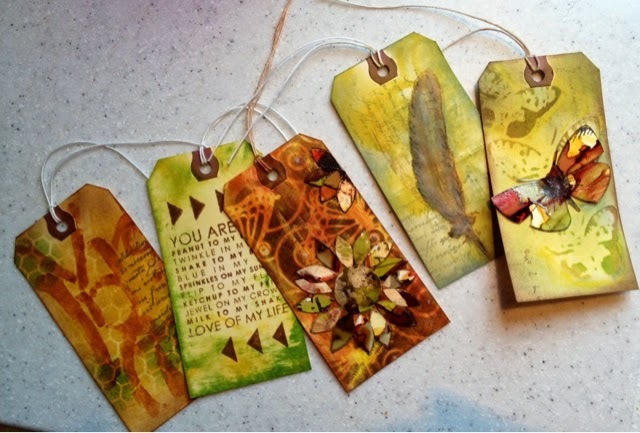 At the moment I will probably uses them as journaling cards in an altered vintage book………or a gift tag……….or a bookmark…….it goes on and on……. May you recognize many blessings this week!